Measures 10-3/4" long, 3" deep, 7/8" tall. Bottom of loft is marked, "©1974 Hasbro®, MADE IN U.S.A.". 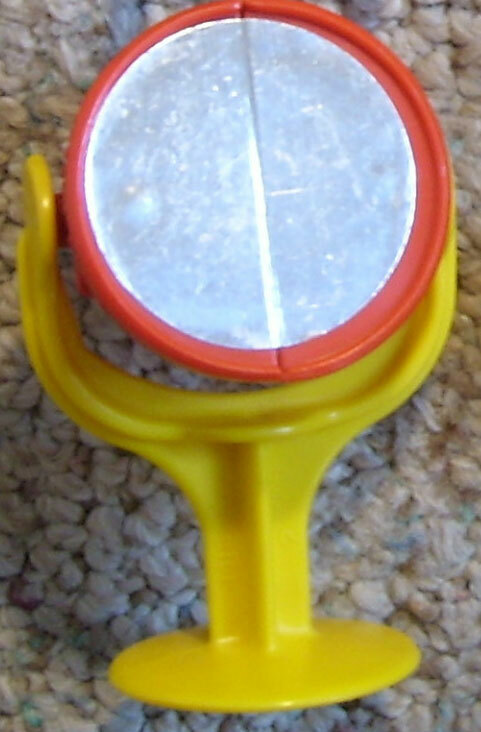 Description: Small brown plastic telescope with a small peg on one side. The peg allows the telescope to balance on the corners of the HTW213 crows nest. Description: Red rectangular "bed" with an egg-shaped recessed area for a Weeble figure to lay down. 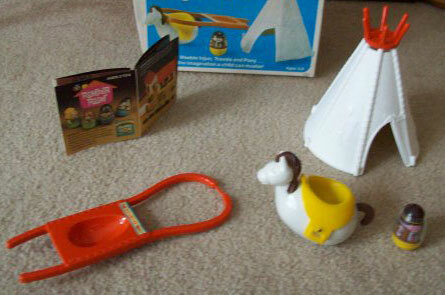 The top edge has a large loop attached (loop fits around Weeble horse figure), and the 2 bottom edges have 1" long "poles", allowing the travois to carry/transport a Weeble figure, like a stretcher. Description: Small red bowl-shaped light with a round reflective/mirror "light". The outside edge has 2 small round pegs (to attach the light to the light stand). Description: Small red upright 2-arm wishbone shape spotlight holder that stands on a round base. 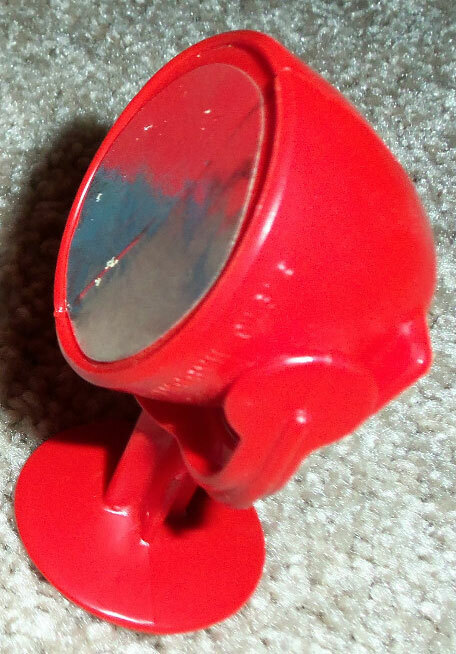 Description: Red one-piece plastic TV camera that stands upright on a round base. One side of the camera has a raised imprint marked "MM TV". 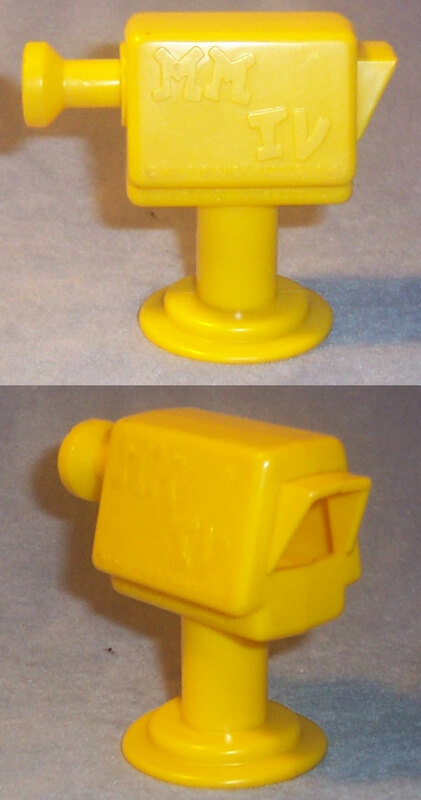 Description: Yellow one-piece plastic TV camera that stands upright on a round base. 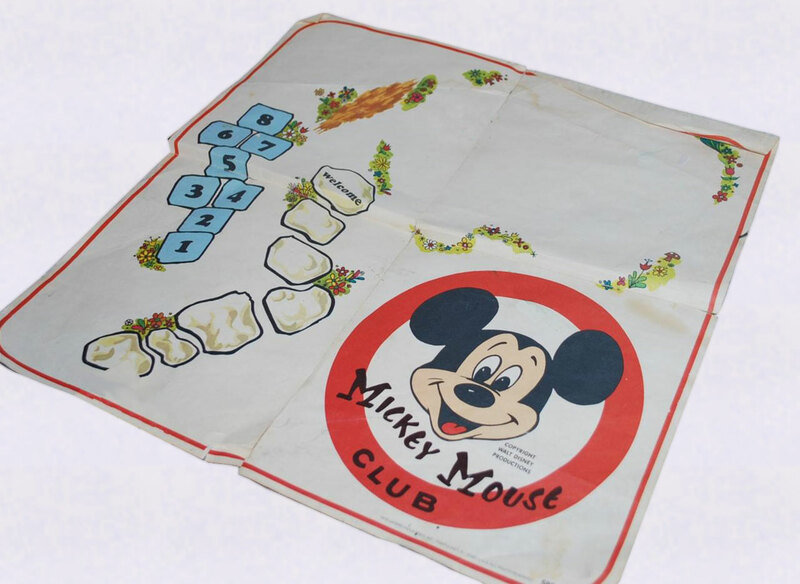 Both sides of the camera has a raised imprint marked "MM TV, ©WALT DISNEY PRODUCTIONS". 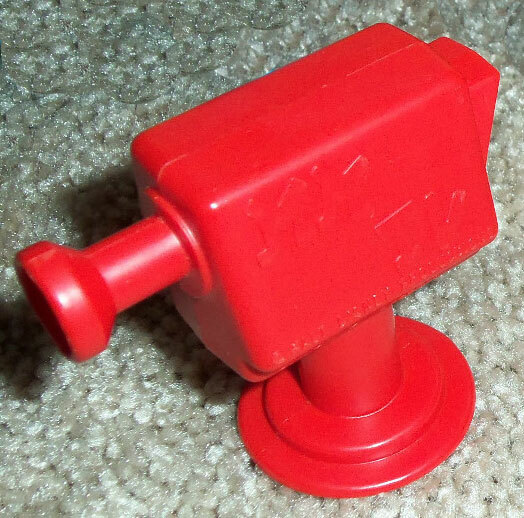 One side is also marked, "1976 Hasbro®"
Measures 2-3/8" tall x 2-5/8" long (to tip of lense) x 1-1/2" wide round base. Description: Small yellow bowl-shaped light with a round reflective/mirror "light". The outside edge has 2 small round pegs (to attach the light to the light stand). Description: Small yellow upright 2-arm wishbone shape spotlight holder that stands on a round base. Description: Flat red plastic boat anchor with a loop through the top for the attached rope (opposite end of rope has a loop to attach to a red knob on the S.S. Littleputt front deck). Description: Blue fishing rod with a peg under the reel that fits into an upright fishing pole stand on the S.S. Littleputt back deck. A rope fits within the reel, and runs down to the tip of the pole. The end of the rope is attached to a blue plastic (magnetic) hook. Description: Tall red gas pump with a square base, black rubber gas hose, and a square litho of a gas pump dial (marked "regular" and "premium").